So, I've never done a written book review online before, so this is new territory for me. I promise I'll warn before any spoilers don't worry. I thought that I'd start with a series that's getting a lot of hype at the moment and that is Marie Lu's Legend trilogy. I'll mostly review the first book, then give just like a brief summary of the second two, just to get ya 'cited for them. I was kind of scared to start them to be honest because I was afraid that they would be another version of the Hunger Games, (which I loved, but don't want repeated to me with different names) I thought it would be another predictable, obvious dystopian, but I was wrong. Marie Lu creates her own path within the dystopian genre, there are the classic dystopian trademark groups the Patriots being the rebel group, but our main characters don't just break the mould they make their own. Not only are the characters original, but the setting and the plot twist and turn so as your never quite sure who it is that your actually routing for. Which was a relief, as I could allow myself to enjoy the trilogy without constantly comparing it to other dystopian books that have come out recently. The trilogy begins in Legend, set in the Republic of America, about a hundred years into the future. Legend is told from two points of view. June, a wealthy prodigy that lives with her brother, and though her parents died when she was young she has had life easy. The second point of view is of Day, the Republics most wanted criminal. We get to know the characters very quickly and connect very well with them from early on in the book, which means the pace of the novel moves very fast bringing us along with it. There may be some spoilers from this point on, so if you don't wanna know then you should probably look away now. Okay so every one left has read at least the first book? Cool, ok, on with the review. Day's family are from a very poor region, which is quickly becoming a breeding ground for the plague. When his younger brother Eden becomes infected Day breaks into the hospital to try to steal medicine. But things go horribly wrong, and in an attempt to flee from the scene Day throws a knife at the shoulder of the soldier trying to prevent his escape. Here's where the novel takes off, Day escapes the hospital, but it was June's brother who had been the soldier, and when others come to the scene it is discovered that Metias (June's brother) was dead. June, is given the opportunity to hunt down Day and bring justice to her brothers memory. I won't give away too much more of the plot just for you stragglers who think you won't read it, then decide in a month or so to do so, trust me I've been there, you'll regret it. Any who, I thought I'd tell my favourite parts. I suppose this is the real spoiler section. I loved it when June discovered that Day was Day, and her internal conflict, to turn him in? To deny Metias Justice? I loved how she became almost shy around him, just before she turns him in. Another of my favourite parts was towards the end when June is interrogating Day, and manages to keep her aggressive exterior. I also loved how brilliantly Marie Lu showed how June swapped loyalties. It was perfect, just the right amount of doubt before the reality sunk in. I also loved/hated Thomas. Argh! that betrayal revealed at the end! How could you? How could you? The next book, Prodigy, is the one that I was most worried about. This is where the predictability usually kicks in. Now their gonna break up, Now their gonna join the rebels, Now others will realise that there is something wrong with this society. Breathe a sigh of relief because it's not quite as obvious as that. There's not as much put in there just to 'please the teens'. The action scenes had a bigger role, and some of the characters who I expected to be stereo typical really were not. Especially Anden. I was prepared to hate the spoiled brat, the younger version of his father that didn't care that the country was falling to shreds, but no, I was wrong again. I really liked the guy. I thought he was deadly. I also liked that we got to see the Colonies, and see that they weren't in the blissful state that it was believed they were in. 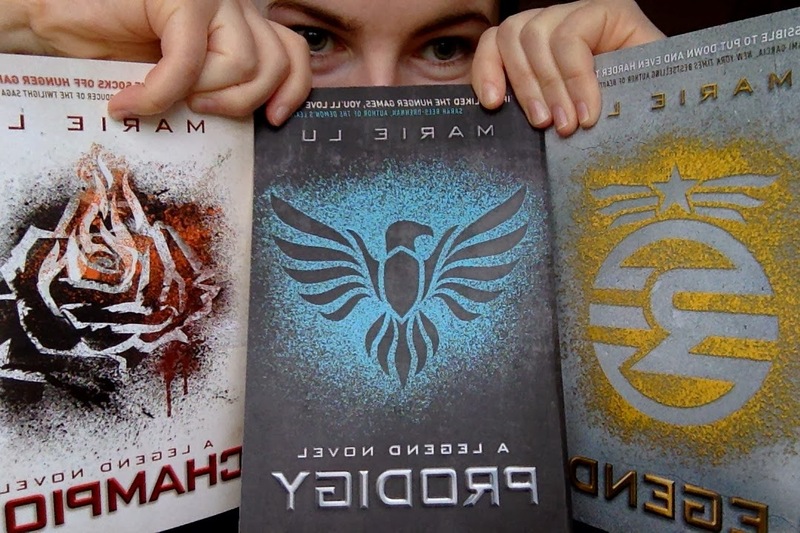 The actual ending to the trilogy was really devastating, I'd purposely stayed away from dystopian books for a while before I read these to make sure I wasn't sick of them by the time I'd gotten to this one, cause I really did want to enjoy it. So the end of these books for me was really, really devastating. I couldn't believe how many years had passed before certain things were resolved.